Michelangelo Antonioni, as film critic Urs Richter once wrote, is the photographer among European directors: Image composition dominates montage and the moment wins out over chronology. Clemens von Wedemeyer’s 35-mm film (transferred to video) Silberhöhe (Silver Heights), 2003, cites the closing scene of Antonioni’s L’Eclisse (1962): Moments of waiting in which the passing of time becomes palpable. 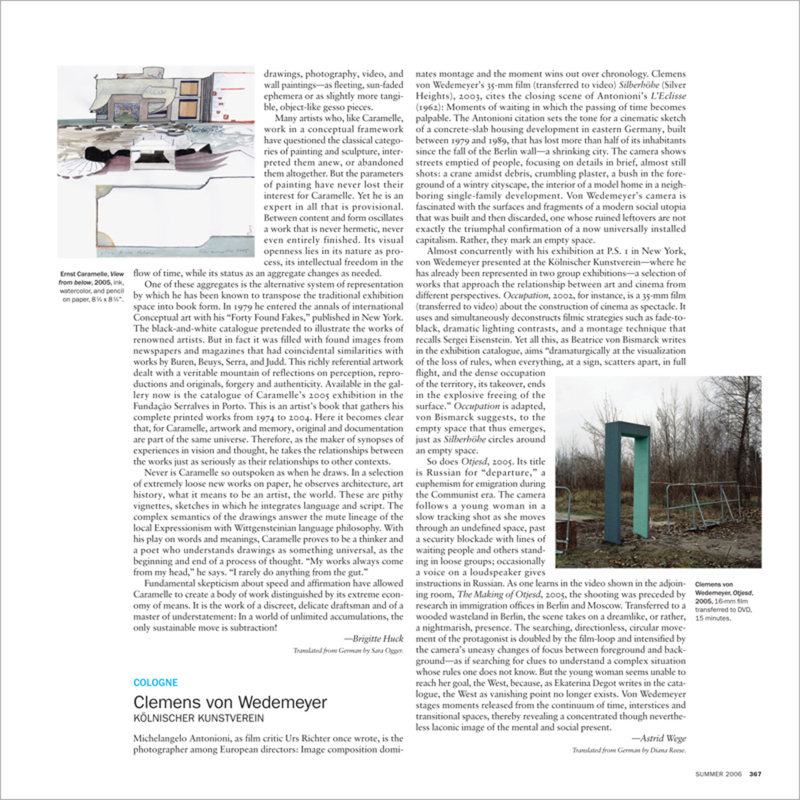 The Antonioni citation sets the tone for a cinematic sketch of a concrete-slab housing development in eastern Germany, built between 1979 and 1989, that has lost more than half of its inhabitants since the fall of the Berlin wall—a shrinking city. The camera shows streets emptied of people, focusing on details in brief, almost still shots: a crane amidst debris, crumbling plaster, a bush in the foreground of a wintry cityscape, the interior of a model home in a neighboring single-family development.